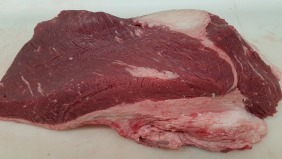 The whole beef brisket is a cheap cut that weighs about 11-14 lbs., most meat shops and grocery store usually cut the brisket into two pieces. 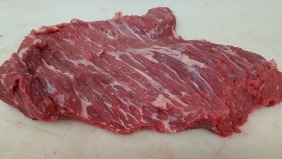 The brisket actually consists of two muscles, the larger leaner flat cut or sometime called first cut, weighs about 7-9 lbs and the second cut or sometimes called front cut, is a smaller, fattier cut weighing about 4-5lbs. The brisket is a tough piece of meat, so you can not throw it on the grill and cook it the same way you would cook a t-bone steak, unless you enjoy chewing on leather. Because of connective tissue called collagen found throughout the brisket it needs to reach temperatures of 210-220 degrees to be tender. 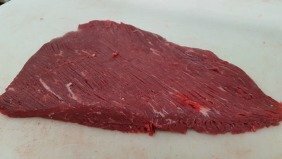 The brisket has great flavor but should be cooked slowly at a low heat, it is a cut that will shrink a fair amount so allow at least 3\4 a pound per person in its raw state. 1. Adjust oven rack to the middle position and heat oven to 300 degrees. Season the brisket generously with salt and pepper. 2. In a dutch oven or stock pot heat 2 tablespoons of oil on medium high heat, sear both sides about 4-5 minutes. Remove the brisket from the pot to a plate. 3. Reduce the heat to medium, add 2 tablespoons of brown sugar, chopped onions, celery, garlic or any of your favorite seasonings, stirring, until beginning to brown, 7-8 minutes. 4. Return brisket back to pot and add enough liquid to cover the brisket. Cover with lid, bring to a simmer over medium heat and then transfer pot to the oven. 5. Cooking brisket in the oven, turning every 30-40 minutes for 3-4 hours, until fully tender and a meat fork slices easily in and out of the meat. 6. Transfer from the pot, tent with foil 15-20 minutes before you slice the brisket thinly across the grain. Season the sauce with salt and pepper, add 1 tablespoon of cider vinegar to taste if you wish and spoon the sauce over the meat.